The Mughal Era is one of the intriguing and fascinating time periods in the Indian history. And it is also one of the least explored when it comes to historical fiction novels. One of the most famous emperors of this era is undoubtedly Shah Jahan. The monument – Taj Mahal, he built in memory of his wife Mumtaz Mahal is touted as the 7th wonder of the world. We have all read about him and his wife and their love, in textbooks during our school days. However, there is little mention of their daughter – Jahanara who was anointed the queen of India after her mother’s death. Ruchir Gupta's book, Mistress of the Throne explores this fascinating period of the Indian history through the eyes of Jahanara. Narrated in the first person in the voice of Jahanara, the novel dwells on the ups and downs during the reign of Shah Jahan, it gives us an account of Mumtaz Mahal’s death and the incidents that followed her death, the tension that brewed between the sons of Shah Jahan and much more. We also get insights into Jahanara’s own life – her emotions, her relationship with her mother, father and siblings, her yearning for love, her vulnerabilities and weaknesses. The book is an epitome of fiction and history entwined beautifully and seamlessly. 1631. The Empress of India Mumtaz Mahal has died. Yet, rather than anoint one of his several other wives to take her place as Empress of India, Mughal King Shah Jahan anoints his seventeen-year-old daughter Jahanara as the next Queen of India. Bearing an almost identical resemblance to her mother, Jahanara is the first ever daughter of a sitting Mughal King to be anointed queen. She is reluctant to accept this title but does so in hopes of averting the storm approaching her family and Mughal India. Her younger siblings harbour extreme personalities from a liberal multiculturalist (who views religion as an agent of evil) to an orthodox Muslim (who views razing non-Muslim buildings as divine will). Meanwhile, Jahanara struggles to come to terms with her own dark reality: as the daughter of a sitting King, she is forbidden to marry. Thus, while she lives in the shadow of her parent's unflinching love story, she is devastated by the harsh reality that she is forbidden to share such a romance with another. Mistress of the Throne narrates the powerful story of one of India’s most opulent and turbulent times through the eyes of an unsuspecting character: a Muslim queen. It uses actual historical figures to illuminate the complexity of an era that has often been called India’s Golden Age. This book is a boon to lovers of historical fiction. It is an immensely satisfying read – one of the kinds that linger in your mind long after you have read it. That the author has done an extensive research for writing the book is easily visible. The narration in the book is impeccable and doesn’t let your concentration falter. The characters are vividly sketched – you can almost imagine everything in your mind as your turn pages after pages of this engaging novel. I had an instant liking for Jahanara – she is sensible, strong and inspiring. One can understand her dilemma when she has to decide between her love and duty; it does take a lot of character to be able to sacrifice one’s own happiness for the greater good of the family and the kingdom. This was also the first time I came to know that daughters of the Mughal kings were forbidden to marry. It was a law imposed by Emperor Akbar and was called off during the reign of Aurangzeb. The author also shares this and some other details in a Q&A section at the end of the book – like what inspired him to write this book, why he chose Jahanara as his protagonist and much more. I was kind of sad when the book ended – I wished it could go on a little more. Looks like my wishes were answered – the good news is that the author is working on a sequel to this novel – The Hidden One. It will continue from where this book ended and will be focused on the life of Aurangzeb’s daughter – Zebunissa. I am already looking forward to it. As said by Stephen King - 'Books are uniquely portable magic', this book lives up to this saying. As you read it you will be transported to an era gone by. 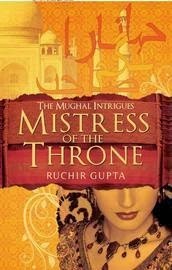 Mistress of the Throne by Ruchir Gupta is one book that I will highly recommend to all book lovers especially those who like historical fiction. This book is the kind that will have you turning its pages in the middle of the night in the hope that you could read a little more before you sleep. One of my best reads in recent years. I received a review copy from the author in exchange for an unbiased review.